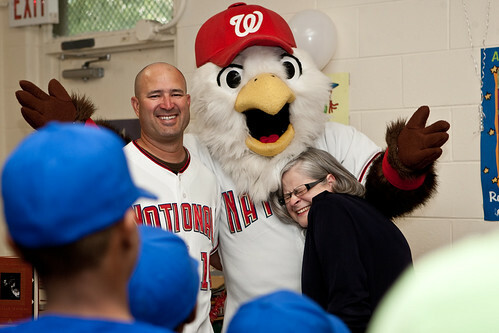 Late last night, on the heels of yet another disappointing loss, the Nationals fired Manager Manny Acta. The firing, while not remotely unexpected, comes just a few weeks after the Nationals had publicly recommitted to Acta. Acta leaves the Nationals after two and a half seasons with a record of 157-251, a winning percentage of just .385. Many of these losses can be laid at the feet of bad pitching, worse defense, and a bullpen with a tendency toward complete and total collapse. Acta’s calm demeanor and seeming unflappability in the face of a failing ballclub, though, made it is easy to see him off. His inability to motivate his players, though, is what sealed the deal. The Nationals have largely been rudderless this year, struggling even to put together back-to-back wins this season. Replacing Acta will be Jim Riggleman, the Nats’ bench coach. Riggleman spent a season and a half with the San Diego Padres in the early 1990s, and five seasons with the Chicago Cubs in the mid 90s before taking a nearly ten-year break from the top position. In nearly 1200 games as manager of an MLB club, he’s amassed over 500 wins, putting him at a .445 winning percentage. Will Riggleman be able to command the respect and admiration of his players? Or will he be another softy like Acta? Be sure to read between the lines on the Nationals’ announcement. Acta’s likely taking the fall for the bullpen’s incompetence, the defensive issues in both infield and out, starting pitching that’s either great or disaster, and bats that are as inconstant as the shadows from which they emerge. Is Acta to blame for Dunn’s frequent miscues? Zimmerman’s errors? Josh Bard’s horrific defense behind the plate? No, none of these. But he is to blame for the hangdog attitude in the clubhouse, and a nigh-constant resignation to losing. Acta’s absolute pacifist approach to the game has been entirely too frustrating for the fans to deal with. While the Nats took the back end of two terrible calls in New York in May, both of which were game-changers, Manny went out, had a perfunctory and passive conversation with the umpires, accepted their verdict like a meek child, and sat back down. He was going through the motions with no real investment in the team’s fate, as if he had no control. Bard/Nieves, C: With Jesus Flores on the DL for just about the rest of the season, it looks like we’re stuck with the pair behind the plate of Josh Bard, who’s playing injured, and Wil Nieves, who’s pretty much playing blind. Bard’s defense could be considered, on his best day, as atrocious, and Nieves’ bat, contrary to the opinion of that damned MASN ad, is colder than a Montreal winter. Grade:B- for Bard, C+ for Nieves. Both need help, and badly, but it’s a long way off. We’re going to have to struggle here. Nick Johnson, 1B: Nick’s healthy, and that’s a great start. His .305 batting average and nearly 40 RBIs are a little lower than I’d like, but they’re a pretty decent start. It’d be nice to see a return to 2006 form, when he hit 23 homers and drove in 77 runs, and a return to 2005 form, when there were just 7 errors. This is a bright spot for the Nats, but not as bright as it should be. Grade: B. Solid, but not excellent. Hernandez/Gonzalez, 2B: Look for Alberto Gonzalez (should we just call him the Attorney General?) to get more playing time in the second half, and platoon with Anderson Hernandez, whose offense and glove have gone cold. Gonzalez is hot, but is this just a streak? Expect him to get more time in the second half. Grade: Hernandez gets a C-, Alberto Gonzalez gets an Incomplete, but leading toward a B.
Cristian Guzman, SS: 12 errors. 12. Sure, he can hit the ball, but muffing double plays is costing the club more runs than he’s producing. And with the pitching staff as shaky as it is, we can’t afford unearned runs of any kind, let alone the kind that the Nats 82 errors have produced. Let’s hope that Guz comes back from the All-Star Break having taken some time for infield practice. Grade: D. We need Guz to lead this club a bit more. He’s hitting great, and that’s fantastic, but maybe Guz can lead a defensive charge in the second half. Or maybe not. Either way. Ryan Zimmerman, 3B: The face of the franchise is also the face of defensive failure in the first half. Zim’s on pace for 27 homers, and 100 RBI, which would be tremendous, but he’s also on pace for 21 errors. That’s far from acceptable for the hot corner. Adam Dunn, LF: I’m of two minds when it comes to Adam Dunn. Strictly from the fan’s perspective, he makes the team a whole lot more watchable at the plate. His looming presence forces a lot more hittable pitches for Johnson, which might be part of Johnson’s resurgence behind the plate. But, Dunn’s 10 errors in left, and errant throwing arm make him a giant flashing “HIT IT HERE” sign in left. Fortunately, the addition of fleet-footed and agile Nyjer Morgan in center will take some of the pressure off. It’s a shame that the Nats can’t wiggle their way into the AL, where Dunn could live in the DH slot and be nothing but an offensive monster. Grade: B-. Offense is there, now we just have to minimize the defensive gaffes and get him to lead the team a bit more. Dukes/Harris/Morgan, CF: The only bright spot in our lineup is occupied by a platoon of these gentlemen. That should say something, since they collectively hit about .250, but Willie Harris and now Nyjer Morgan have been playing with a great deal of heart, despite their presence on the worst team to play the game in 40 years. Elijah Dukes has been something of a disappointment, but he still has it defensively. Let’s see how these guys do if the Nats should find themselves on a bit of a tear. Grade: B-. Steps in the right direction. It’s too soon to know if Nyjer Morgan’s the answer to our woes, but so far he seems to be doing a solid job. Kearns/Willingham, RF: Well. Kearns is hitting .196. Willingham can’t hit a homerun with men on base. That’s enough to give a pretty horrid grade, don’t you think? Grade: D. Kearns has to hit or be DFA’d, Willingham needs to put the ball in play when the bases aren’t empty. Let’s get to it, men. Starting Pitching: If this were a month ago, it’d be a flat-out F. Since then, though, they’ve strung together a series of quality starts from John Lannan, Jordan Zimmermann and Craig Stammen. Each of them have gone much deeper in their most recent starts, in some cases going the distance. Firing St. Claire might’ve been the difference, but it sounds like these guys have just started to behave like major leaguers instead of minor leaguers they had been impersonating. That still means they only have three quality starters, with Scott Olsen and Garrett Mock being wildcards who’ve not started enough recently to flesh out a complete rotation. We’ll see, but there’s cause for some optimism. Grade: F for April/May/Early June, B- for Mid-June and July. Needs improvement still, but stepping in the proper direction. Relief Pitching: You’ve heard the refrain on this one before. It’s bad out there. It’s really bad out there. The Nationals bullpen, the Gas Can Boys, are terrible, really really terrible and just plain bad. There’s nothing good to say here, so let’s just give out the grade. Rizzo, GM: It’s early yet to tell if Mike Rizzo is going to follow in the footsteps of Jim Bowden, but it seems to be that his first half of a season in the big chair has been a strong one. The trade for Morgan and Burnett, though, has already come down in our favor, which I can get behind. Here’s hoping the Lerner family coughs up some money so has a budget to work with this off-season. Grade: B+, largely for the Morgan/Burnett trade.